1. Bynum, Caroline Walker, “In Praise of Fragments: History in the Comic Mode,” in Fragmentation and Redemption. Essays on Gender and the Human Body in Medieval Religion (New York, 1991), 25. 2. Sperber, Jonathan, Rhineland Radicals. The Democratic Movement and the Revolution of 1848–1849 (Princeton, 1991). Incidents appear on 148 and 339, respectively. 3. Walker, Mack, German Home Towns, Community, State, and General Estate 1648–1871 (Ithaca, 1971). 4. Allen, William Sheridan, “Farewell to Class Analysis in the Rise of Nazism: Comment,’ Central European History 27, no. 1 (03 1984): 54–63. 5. Other historians had also, however, begun to move in the same direction: cf. Langewiesche, Dieter, “Die deutsche Revolution von 1848/49 und die vorrevolutionäre Gesellschaft: Forschungsstand und Forschungsperspektiven,” Archive für Sozialgeschichte 21 (1981): 458–98, esp. 472. 6. “In this period, a pronounced Protestant-Catholic antagonism was a part of everyday life,” Sperber, Radicals, 78. Rare acts of anti-Semitic violence were “far outnumbered by acts of violence stemming from inter-and intraconfessional conflict among Christians, who seem to have been too busy being hostile to each other to have had a lot of enmity left over for Jews.” Ibid., 79. Contrast Sperber. Popular Catholicism in Nineteenth Century Germany (Princeton, 1984). 7. Anderson, Margaret Lavinia, Windthorst. A Political Biography (Oxford, 1981). 8. Indeed it may remain hard-wired into the responses of twentieth-century German historians as well. 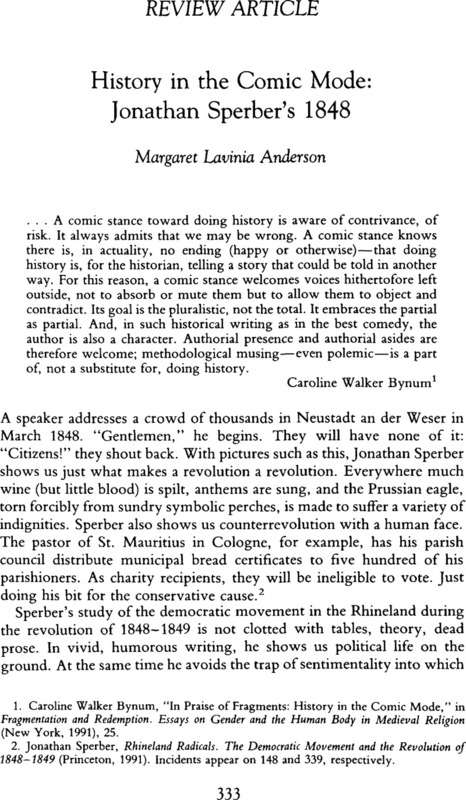 Sperber's recent critique in these pages of Hans-Ulrich Wehler's unblushing anti-Catholicism (“Master Narratives of Nineteenth-Century German History,” Central European History 24, no. 1 [Spring 1991]: 69–91) reminds one that the eminent Bielefelder grew up in precisely one of those few right-bank towns that had belonged to Prussia before 1814 and thus (with a population, in 1854, 12 to1 Protestant surrounded by a population 6 to 1 Catholic) right smack on the confessional frontier: you can take the boy out of Gummersbach, but you can't take Gummersbach out of the boy. 9. Nipperdey, Thomas, for exmple, in his account of 1848 in Deutsche Geschichte 1800–1866. Bürgerwelt und starker Staat (Munich, 1983) insists that “one does not understand the German revolution if one does not bring into full account the depth of confessional animosity and the fact that they reached further than parliament and parties…confessional conflicts and passions were a reality of the first rank” (618) and that the strong tensions between the confessions and between church people and anti-church people “weighed down the impetus for freedom ” (668). But he does not find a way of showing how this reality and this weighing-down actually worked. 10. Here again, Sperber silently departs from his earlier work, which, by using the terms “Catholic” and “clerical” almost interchangeably, obscured the fact that before the Kulturkampf many West-German Catholics had been on the Left. Now we find Catholics by no means in the thrall of clericals (cf. 310, 339), and discover that Düsseldorf and Trier, bastions of the Center Party in the late nineteenth century, were hotbeds of revolution in 1848–1849. 11. One is reminded of Clifford Geertz's story of the anthropologist and the villager: when the anthropologist, seeking a more precise explanation of the local cosmology, asked on what the turtle rested that carried the elephant that bore the platform that held up the world, the villager replied: “Ah Sahib, after that, it is turtles all the way down.” Geertz, Clifford, “Thick Description: Toward an Interpretative Theory of Culture,” in idem, The Interpretation of Cultures (New York, 1973), 29. 12. See Siemann, Wolfgang, Die deutsche Revolution von 1848/49 (Frankfurt/Main, 1985);Wollstein, Günter, Deutsche Geschichte, 1848/49. Gescheiterte Revolution in Mitteleuropa (Cologne, 1986); Thomas Nipperdey, Deutsche Geschichte 1800–1866; Wehler, Hans-Ulrich, Deutsche Gesellschaftsgeschichte, vol. 2, 1815–1845/49 (Munich, 1987). 13. Contrast Nipperdey, ibid., 668; Wehler, ibid., 762, 766; Siemann, ibid., 224 and passim. 14. Contrast Langewiesche, “Die deutsche Revolution von 1848/1849,” 473. 15. Thus Nipperdey: “Today the reproach against the Liberals, the Middle, the Bürger, even when the betrayal thesis is abandoned, in common coin. Therefore we must turn to it.” Deutsche Geschichte, 664. The Liberal-Left split was (1) not the fault of liberals moving to the Right, since they didn't (665); (2) not unbridgeable (668); and (3) not responsible for the revolution's failure (667). 17. This refusal is particularly glaring in a conclusion that is notable for making wide-ranging connections backwards and sideways: with the Reformation, with various French revolutions, with Missouri politics in the 1850s! 18. Stearns, Peter, 1848: The Revolutionary Tide in Europe (New York, 1974). cf. also Wollstein, Deutsche Geschichte, 776–77. 19. Even Nipperdey's balance sheet comes out more positively than Sperber's. Only siemann (228) presents an unrelievedly negative conclusion. 21. Nipperdey, Deutsche Geschichte, 632; Wehler, Deutsche Gesellschaftsgeschichte, 771; Sperber, Rhineland Radicals, 476. Wollstein, Deutsche Geschichte, 105, quotes them as well, but not as part of his explanation. 23. Nippeday, in arguing that the Left's only chance for success lay in a European war against Russia, applies to them Louis XV's famous mot, in reverse: the Left “were willing to risk the deluge, because they would come after it” (666)—a pretty damning judgment. Wollstein refers to the “ineluctability” of the failure (Scheitern) of the revolution, not least because of the “all too limited political maturity of the German nation” (177, cf. also 100). Siemann, though he credits the Bürgertum in 1848 with “astonishing” political “maturity” (255) and even questions the term “Scheitern” presents perhaps the most pessimsistic picture of them all, ending with a balance sheet uniformly negative. 24. The difficulty Germans have had “accepting” their revolution can be read in the titles of some of the earlier books devoted to its history: 1848: Die unvollerndete deutsche Revolution, by Paul Wentzcke (Munich, 1938); Grösse und Versagen des deutschen Bügertums, by Wilhelm Mommsen (Stuttgart, 1949); Die Tragödie des deutschen Liberalismus, by Friedrich sell (Stuttgart, 1953). In an invocation of psychoanalytical concepts unusual for West-German historians, Franzjorg Baumgart has described the history of the German revolution in terms of the history of its “repression” (Die verdräangte Revolution: Darstellung und Bewertung der Revolution von 1848 in der deutschen Geshichtsschreibung vor dem ersten Weltkrieg [Düsseldorf, 1976]), a notion that has subsequently been picked up by Siemann (“Verdrängung” and “Bewältigung,”7). Though no one would now agree with Rudolf von Bennigsen's judgment on the revolution's fiftieth anniversary that it was “nur eine sehr peinliche “Episode”(quoted in Siemann, 10), it is only the “nur” and the “Episode” that have dropped out of historical analysis: the “peinlich” remains. 25. One sees this most strongly in Nipperdey, the oldest of the four, for whom the story of the democrats is “a great, sad, fruitless history of the failed” (662) and who describes the “unavoidable” split between the middle and the Left as “tragic” (667). 26. Bynum, “In Praise of Fragments, ” 11–26, especially, 25.